The new MedCat armored ambulance is designed to take paramedics into dangerous situations. BOISE — In the most dangerous situations, emergency responders across the Treasure Valley work hard to protect our communities. To best do their jobs though, they need the best equipment possible. Monday, Ada County Paramedics unveiled a brand-new vehicle to help them in unique situations -- a custom-made armored ambulance. The armored ambulance isn’t just a game changer for Ada County Paramedics, it's a new step for paramedic services across the country. With the purchase of the MedCat, Ada County Paramedics becomes the first emergency medical services organization to have its own MedCat. 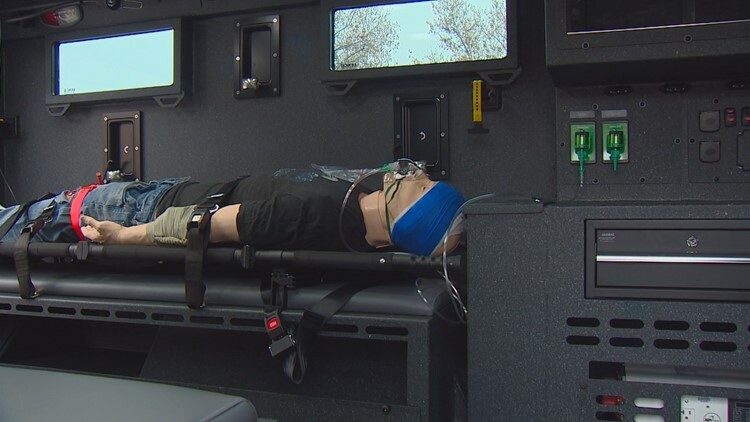 "This vehicle is specifically designed for the rescue of citizens and officers who may be involved in situations that aren't accessible to normal ambulances," said Chris Shandera, Ada County Paramedics Tac Med Commander. Interior of MedCat armored ambulance for Ada County Paramedics. The 2018 Lenco MedCat is designed to deal with tough situations like an active shooter, or SWAT standoff. "It's a great tool to have in our toolbox, and we expect to be able to deploy it into any of those situations that we need to," Shandera said. In the past, Ada County Paramedics borrowed armored vehicles from other agencies, like Boise Police, if they were needed at the scene of an active situation. "The hard part is those things are not specifically designed for taking care of patients. We can adapt to those situations, but this really helps us get the job done more efficiently," Shandera said. That fact showed they needed a better strategy for patient evacuation and treatment in dangerous situations. That point was exemplified in November 2016, when two Boise Police officers were shot during an incident. "We've identified as a system that a gap in our response is maybe being able to get to some of those victims that our regular ambulance can't. When time is of the essence and we are in the presence of trauma this really helps us bridge that gap and we have the potential to save a lot more lives," Shandera said. The vehicle is not only tough, it has all the tools inside to save lives. "So we are able to provide advance life support in the back of this vehicle in a high threat environment which us something a regular ambulance wouldn't have access to," Shandera said. The $300,000 MedCat was purchased by Ada County Paramedics with a grant from the Department of Homeland Security. Paramedics say it is worth every penny. "You can't ever put a price on life and the capabilities that this vehicle has the potential to save many lives," Shandera said. Ada County Paramedics know they have to be ready for anything, and now they have a brand-new tool for the worst-case scenario. "It's unfortunate as a society or as a culture that we have to think about those threats, but we have to. We as responders have to be ready to address those," Shandera said. The MedCat will be primarily working with SWAT and tactical teams from the Boise Police Department and the Ada County Sheriff's Office. The goal is to have it ready to respond at the start of 2019.